Tag Archives: Cuba Gooding Jr.
Eugene Brown screwed up bigtime. He landed in prison for 18 years for sticking up a bank. But in prison he got lucky. He had a mentor who taught him to play chess, and to always think before you move. This became the metaphor Eugene used to earn his redemption. He used it to reflect on the decisions that led him to prison. He stopped blaming others, took responsibility for his actions, and began to work on himself. Playing chess helped. He learned to see all the possible moves on the board, then to make moves based on smart decisions. Which moves would strengthen his position? Which sacrifices were worth making? Which gambits could he afford to offer or accept? 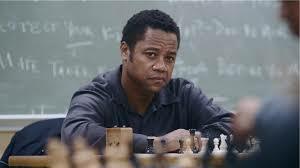 I learned about Eugene Brown lying on my couch watching the movie of this life story, Life of a King, starring Cuba Gooding Jr. It was pretty damn inspiring.